SAN JOSÉ, CA – This year, one could add joy to the Holidays by attending the SAVOY. It is a ballroom where the lively Swing music played by the orchestra makes your feet want to dance, and where listening to the familiar lyrics of many of the songs you love, puts you in the mood for singing along. 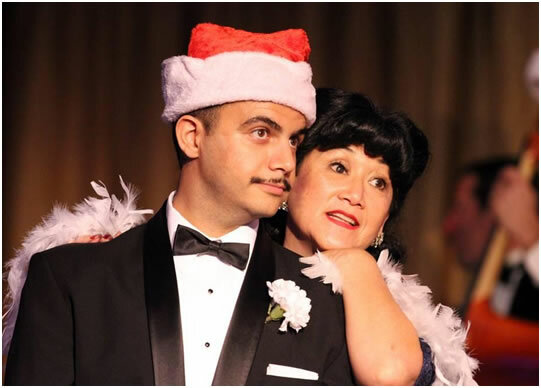 “HOLIDAY AT THE SAVOY a tribute” playing at the TABARD THEATRE COMPANY on San Pedro Square, allows the audience to do both. 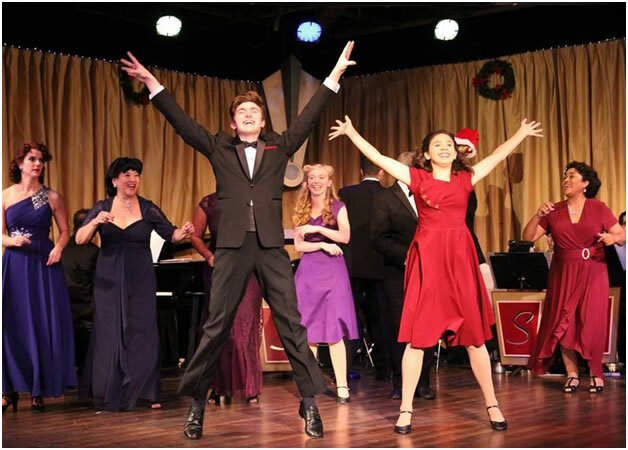 Created by GUS KAMBEITZ and CATHY SPIELBERGER CASSETTA who also Directed the production, “ HOLIDAY AT THE SAVOY a tribute” which is doing its World Premiere in S.J., is also TABARD THEATRE’s way to give their audience the opportunity to end 2017 with joy. The WELCOME page in the program explains that l945 was selected as the year where the action of “HOLIDAY AT THE SAVOY a tribute” takes place, because World War II had ended on September 2, and the American people were happy, filled with expectations, and optimistic with the anticipation of peace. Located at 596 Lenox Avenue, between 140th and 141st Street in the Harlem neighborhood of Manhattan in New York City, The SAVOY was a large ballroom for music and public dancing. One of the first racially integrated Ballrooms in the East Coast. An article written by SAMANTHA NOETH LEWIS, printed on the program, tells us that the “SAVOY” was owned by MOE GALE, that it opened on March 12, 1926 and closed in l958. The SAVOY was luxurious. On the outside, Its Marquee extended out over the sidewalk and a fabulous Marble stairway led into the Ballroom which was huge, painted pink and had a good size foyer. The Ballroom included two bandstands, modern furniture, mirrored walls, luxurious lounges. and colored spotlights. Its dance floor was rectangular in shape, and over l0,000 square ft. Because it was built with spring loaded wood, its floor was so compelling for dancing, that many dance styles originated at The SAVOY because of that floor. Among them: The Charleston, the Lindy Hop, the Jive and the Jitterbug. 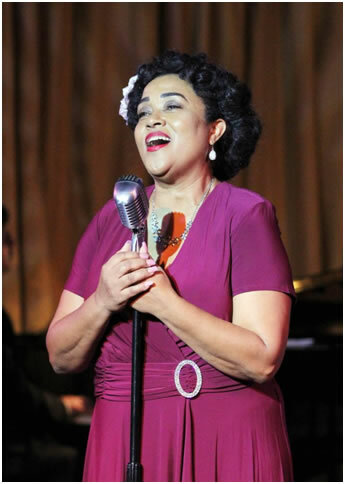 As to prepare the audience for a “HOLIDAY AT THE SAVOY” there is a short “swing” lesson, before the show, in which the members of the audience are invited to participate, if they want to learn how to do the swing steps. After the “class” is over, the show starts. The “show” we watch may be compared to a show in a night club. The body of the musical is a series of different acts which include solo singers, and choruses (Vocal Director IRENE TRAPP) and Dancing couples and group dancers (Tap Dance Captain SAMANTHA NOETH LEWIS and Ballroom dancing STACY CHRISTOFFERSON) All the actors of the show can sing and dance. The show is entertaining because every number is well done. The solo singers have good voices, different timbres and sing in different styles. On Sunday's afternoon show, (12/3) all the singers vocalized their lyrics to perfection. The first act was entertaining. The orchestra sounded lively, the pianist was faultless and even when one of the trumpets was not always in tune, the music sounded good. Because many of the songs were well known, the public enjoyed it. All the actors in the musical are stars, but on that evening, we would like to mention some of the numbers that got the most applause: MIKE HUGILL, MOHAMED ISMAIL and TYLER OKUNSKI in their rendition of “Here comes Santa Claus” JESSICA WHITTEMORE, in a moving version of "Star Dust", Irene TRAPP in her comic “Santa Baby” and ROCHELLE ROBERTS in a marvelous arrangement of "White Christmas"
Compared to the first act, the second act of the show felt too short and many of us felt that it ended abruptly, leaving the audience expecting that the show was going to go on. A solution for ending the show better, may be to change the order of the numbers, since the order of the songs are not listed in the program, placing some of the less-known songs in the first act and all its Christmas numbers on the second act with the purpose to lead the audience musically, step by step into the holiday, with "Jingle Bells" sang by the audience close to the end, and end the show with the entrance of Santa. 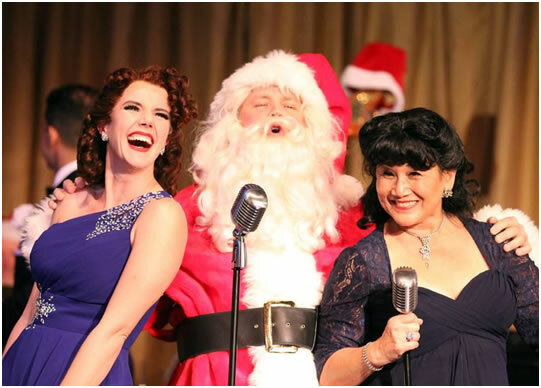 Since Santa is the icon of Christmas, and “HOLLIDAY AT THE SAVOY, a Tribute” is celebrating Christmas, it may be a good ending to the wonderful show.